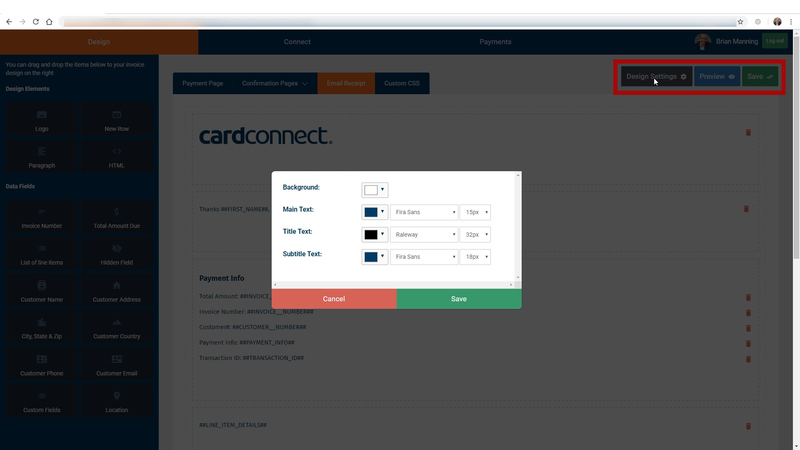 When you set up your CardPointe hosted payment page you get access to a page editor that allows you to edit and change certain fields on the page, if you want to. If you didn’t know that you had access to this editor this video is going to give you a quick peek at many customizations you can do. Welcome to another CardPointe training video. 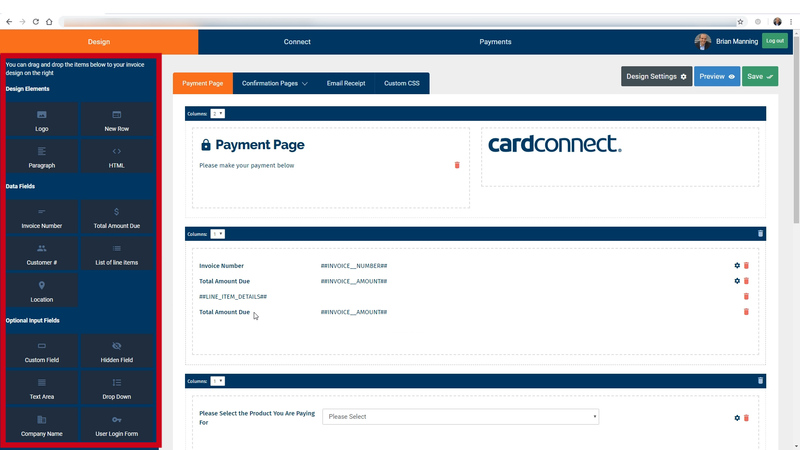 This is Brian Manning and whether you’ve been using the CardPointe hosted payment page for a while now, or you’re about to get started, you should know that you have access to a page editor that allows you to customize the hosted payment page. I’m gonna give you a quick walk through on the editor itself and show you some of the basics so you know what is available to you, to customize on your own. All without the help of a programmer or customer support. When you open your CardPointe account, you’ll get a welcome email and with login credentials to the page editor, you’ll be taken to the DESIGN tab which is the first of the 3 tabs that you can control inside of the page editor. This is what the page editor interface looks like. You can see the page is built with a drag and drop functionality. Here on the left you’ll find Design elements, Data Fields and Optional Input fields that can be added to the page just by clicking and dragging it over to the main part of the page, which is right here. You have some elements of the payment page that are pre-loaded for you which cannot be changed or deleted such as the payment details section, the cardholder name and billing information for example. The main part of the screen shows the page exactly how the live page is laid out. There’s a sub menu that allows you to configure the payment confirmation page, as well as the payment decline page. You can also customize the receipt that gets emailed to your customer after they make a successful purchase. And before we move on to the Connect tab, you have these three buttons here on the upper right. a Design Settings button which let’s you change the background color of the page as well as the font, font size and color of different text elements on the page. You have a preview button which opens a preview of the page in another window in your browser and then finally, a save button which publishes all changes that you have made to your hosted payment page. Next is the connect tab which allows you to build a payment page that holds a specific dollar amount. This feature is useful if you have a product or service with a fixed price and you want a permanent page link to attach to your website or sales process. 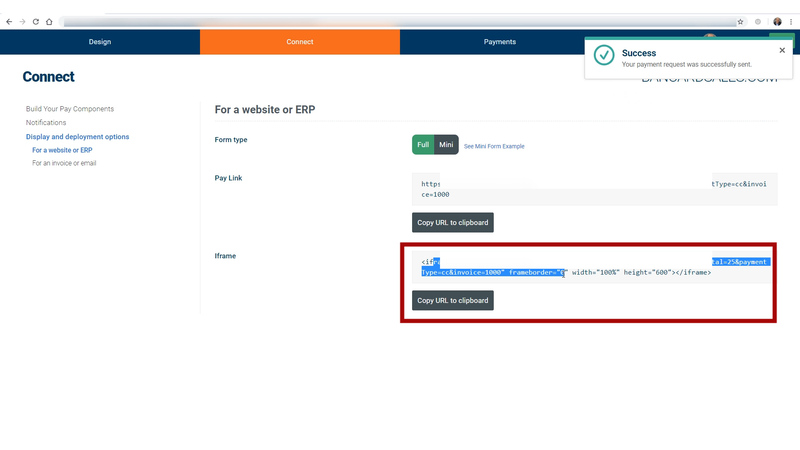 Once you build your payment link, you can embed the page into your website, by copy and pasting simple code given to you, OR you can simply click the option to get the URL payment link and send the link via email. You can also add an invoice number if applicable so you can include the payment link with an invoice if needed. Under the NOTIFICATIONS page, you can deselect the box that tells the system to email your customers a receipt and even specify your own “return to website” URL which would take the place of the default payment confirmation page. Finally, the payments tab is a reporting function and keeps track of payments made through the hosted payments page. If this is the first time you’re seeing the CardPointe hosted payments page and want more information about this page, check the links in the description to get in touch with me. For more CardPointe tutorials, merchant account trainings and payment page tutorials just like this one, be sure to CLICK that subscribe button because I will be covering other payment page options that allow you to further customize your payment collection software. Share it with your friends and colleagues, and comment below if you have questions about the code or the tips shared here.